The Reefs of Writing — Scrivener? I’ve been poring over the first draft of The Reefs of Time and taking copious notes on what I need to change as I rewrite it. To my surprise, I found more places that seem to call for further development than places that need extensive cutting. (There’s always a need for cutting and tightening; that goes without saying. But I’m talking about the light-saber approach that’s sometimes needed to excise long, rambling detours. I didn’t find too many of those.) That’s both good news and bad news. The good part is, the first draft is better than I expected. The bad part is—well, remember the picture I showed you of the first draft? The second draft could be longer. To deal with the complexity of the book—I wrote several different subplots as standalone documents, figuring I would figure out how to braid them together later—I have decided to give Scrivener a try. 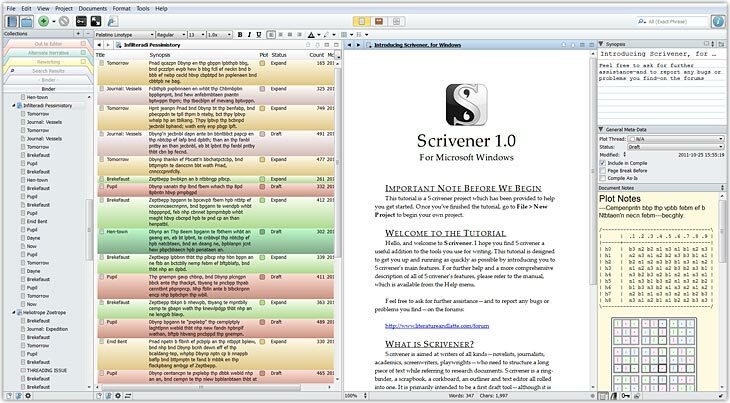 Scrivener is a writing tool designed especially for people like fiction writers, with all sorts of organizational features, including the ability to easily move sections around, as well as keeping notes and research materials at your fingertips. That seems like just what I need. It offers many things that Word does not. Unfortunately, it also lacks a few of Word’s features that I use all the time, such as support for paragraph styles and keyboard macros. An uneasy tradeoff. This is all subject to change, as I test things out. Stay tuned. Sounds like a plan. It will be interesting to hear how it works out for you. I've used Scrivener to help organize my first short story. I think its great but has a learning curve. I see huge potential with the program and its use for writers and look forward to your thoughts on using the program.